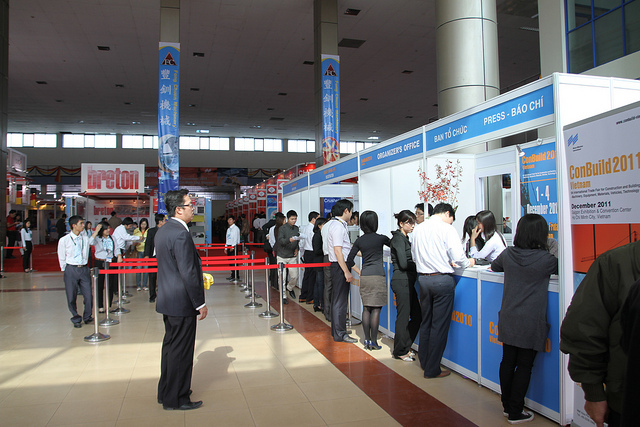 more than 200 exhibitors from 20 countries packed into the Vietnam Exhibition Fair Centre, VEFAC. 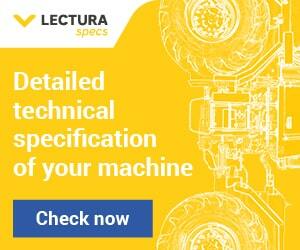 This is the fourth year in succession for the exhibition, last year having seen the show held in Ho Chi Minh City. The 2010 event in Hanoi includes national pavilions for China, Germany and Singapore, and is spread over indoor and outdoor exhibition areas totalling almost 11,000 sq metres. Officially opening the exhibition and its associated international conference, Mr Nguyen Tran Nam, Vice Minister of the Ministry of Construction said that Vietnam’s construction and building industry has been receiving a large volume of investment from domestic and overseas enterprises. “In recent years, Vietnam has commenced many large-scale projects of bridge and road, civil and industrial construction, showing that the demand of construction and building in Vietnam has a big potential and is wide open for more investors to come,” he said. “To carry out the plan and target of construction and building development, Vietnam definitely needs technology and solution consultancy from its partners as well as machinery and equipment operating support. Consequently, ConBuild Vietnam 2010 is an event that brings a practical meaning to Vietnam’s economy and its construction industry.” Also speaking during the opening ceremony was Mr Tran Tuan Anh, Vice Minister of Industry and Trade. 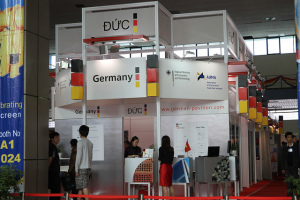 Mr Ronald Unterburger, Managing Director and CEO Asia Pacific of MMI Asia Pte Ltd, said that the exhibition and conference has now become firmly established as the prime international building and construction industry event here in Vietnam. “When we at MMI began planning the very first ConBuild Vietnam, which was held in 2007, we were aware that the event should be very much a two-way street. “Knowledge and expertise needed to pass in both directions to ensure that Vietnam’s crucial programme of infrastructural development could proceed surely, swiftly, and to the greatest benefit for this nation, which is so rich in natural and human resources. “For this to happen in the way envisaged, we needed the full support of the Vietnamese authorities. The grand opening ceremony was followed by a VIP tour of the event, with the four vice ministers and their officials and advisers meeting and speaking to many of the exhibitors. The high number of returning exhibitors and the number of new exhibitors wanting to strategically place themselves in Vietnam’s exciting market is evidence of the success of the ConBuild editions, which have always had a strong focus on new technology and the presence of international expertise, both on the exhibition stands and at the related international conference and seminars held alongside the show. MMI rotates the exhibition on a yearly basis between Hanoi and Ho Chi Minh City, and by participating on an annual basis, exhibitors are able to raise and maintain their profile in both the North and South of the country. 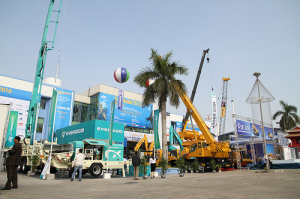 According to figures recently released by the Vietnamese Ministry of Construction, the total production value of the country’s construction sector increased by more than 25 percent in the first seven months of this year, compared to last year’s figures. The increase is seen as an inevitable result of the priority that the Government of Vietnam is giving to the upgrading of the nation’s roads, railways, seaports, electricity and water supplies,all essential as Vietnam develops and becomes a more prominent player in the global economy. The Government has been applying a series of incentives for investors and investment projects including tax preferences, preferences on land use, and giving preferential treatment to investors in industrial parks, export processing zones and hi-tech parks. 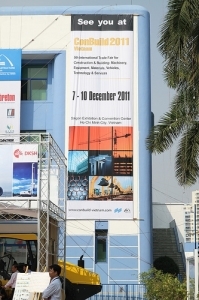 ConBuild Vietnam 2010 is was held from 1-4 December at the Vietnam Exhibition Fair Centre in Hanoi.